Passport Oregon Has a New Home! Oregon is a place of breathtaking beauty that allows for people to explore, learn, and experience adventure. However, not every Oregonian has the resources needed to get outdoors. Our mission is to promote the exploration of Oregon for those who may not have the ability to go on their own. We introduce the youngest generation to our state's wilderness by visiting places like Mt. Hood, the Painted Hills, the Gorge, the Oregon Coast, Smith Rock and the Wallowas. These young explorers experience Oregon's wonders while engaging in activities such as hiking, site-seeing, and time with friends. Our goal is for students to explore, become educated, and become empowered to make nature a part of their lives. 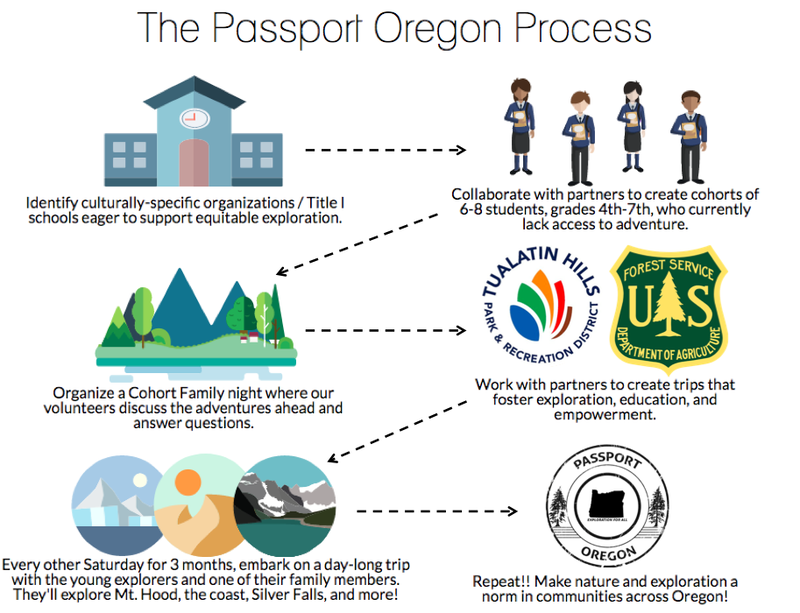 Passport Oregon is a nonprofit that is funded solely on donations. By donor's generosity, we transform funds into experiences. Your donations allow us to partner with school districts and communities to create adventures and memories that will last a lifetime! Watch us on KGW News! Kevin and our student Kimisa share with Portland Today about Passport Oregon and the opportunites it provides! Family Service Day from Passport Oregon on Vimeo.